A familiar face as an actor in the likes of THE MIND’S EYE, BEYOND THE GATES and the recently released DOWNRANGE, Graham Skipper has made his feature writing/directing debut with SEQUENCE BREAK, which combines Cronenbergian body horror with video-game mania. We’ve got the scoop on its forthcoming debut date. RUE MORGUE got the exclusive word that the Shudder streaming service will exclusively premiere SEQUENCE BREAK on May 24 in the U.S., Canada, the UK and Ireland. Chase Williamson (GATES, JOHN DIES AT THE END) stars as Oz, who works in a video-game repair shop and begins to come out of his introverted shell when he begins a romance with customer Tess (Fabianne Therese). At the same time, he becomes fixated on a strange game that first causes him to hallucinate, then causes bizarre biological/technological fusions (courtesy of makeup effects artists Josh and Sierra Russell). 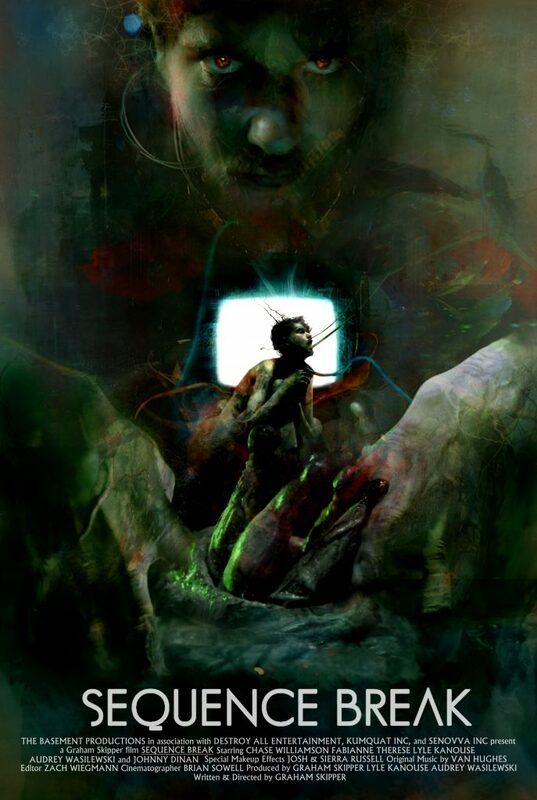 Check out the movie’s original poster (by artist Christopher Shy) and trailer below.